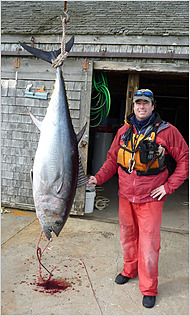 Dave Lamoureux with the 157-pound bluefin, a record tuna for an unassisted kayak fisherman. Copyright NY Times. There aren’t many places in the world where bluefin tuna venture so close to shore that a person can paddle out to cast for them from a kayak. But Race Point off the tip of Cape Cod is one of those places. On the outgoing tide, all of Massachusetts Bay is trying to empty out around that one point of land, and that is where big fish congregate to feed. Fly fishing from a kayak has become a sport in recent years. Recently, the New York Times reported on a fellow who had been trying his hand at kayak-fishing for striped bass last year near Race Point, when he hooked up a small bluefin tuna. The tuna took him for a ride. He has since been perfecting his technique, and so far, the paper recounts, his biggest fish landed weighed 157 pounds! “Bluefins are powerful enough, he said, that if given too little line, they can cause a kayak to flip end over end.” Now there’s a thrill for you. There is no exaggeration in his assertion either. Bluefins are awesome fish – anytime you hook one is a thrill. Frankly, a 157-pound fish may be a trophy to a kayak-fisherman but it isn’t even a keeper for someone with a commercial tuna license. The biggest fish I ever caught weighed in at over 900 pounds – gutted and dressed! It took three of us four hours to land it. Boy was that fun. Sort of like hunting mastodons with pointy sticks. Not that I want to dismiss the accomplishment of the kayak-fisherman – he’s got more moxie than I do. There is something elemental about fighting big fish from a small open boat (ask Santiago). These sorts of elemental challenges are becoming fewer as human engineering rules the planet and the natural world is more removed from daily life. The planet needs wilderness. People need wilderness too – especially civilized people. The ocean is wilderness at our doorstep. Once you get away from the shore and below the waves, it’s wild. The ocean is where I go to connect, again, with something unmistakably real.